This article is about the three elemental Thralls. For the Dead Thrall spell, see Dead Thrall. 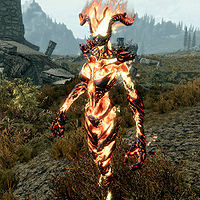 Summons a <type> Atronach permanently. The Elemental Thrall spells are master level Conjuration spells which summon a Flame Thrall, Frost Thrall, or Storm Thrall† to aid you in combat. Elemental Potency, summons the more powerful Potent <type> Thrall. Casting cloak spells, or transforming into a Vampire LordDG, will dispel any summoned thralls. The Thrall spells are not actually permanent, though they may as well be. They last for 999 real-world days (about 2 years, 9 months), though it will be less if you sleep/wait/fast travel a lot. However, the odds of any Thrall actually surviving long enough to expire naturally are almost nil unless you're specifically trying to do that for some reason. This page was last modified on 12 June 2018, at 14:58.